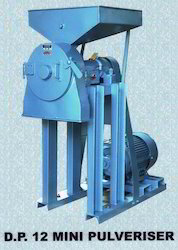 We are one of the leading manufacturers and exporters of Wet Pulveriser/ Wet Pulverizer in Mumbai, Maharashtra, India. We have an experience of more than 50 years in this Industry, we have our client all over the globe. We also manufactures Chemical Pulveriser, Impact Pulveriser, Lab Pulveriser as per industrial requirement. Wet Pulverizer offered comes with enhanced blower air volume and wind-pressure with cyclone collector collection efficiency enhanced by 20%. Further, the system can deliver high-pressure superfine grinding powder in processed size of up to 600 mesh. Some of its features include simple operation and convenient maintenance support; provides for stable performance; superior rolls mill configuration for optimum performance; powder-saving and higher production capacity; smooth and reliable performance among others. Looking for Wet Pulverizer ?